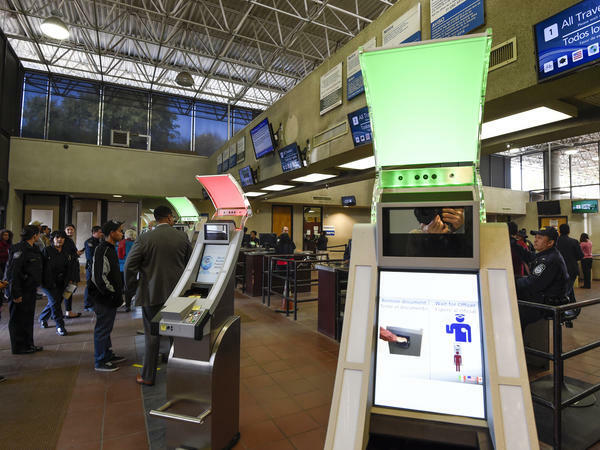 Pedestrians crossing from Mexico into the United States at the Otay Mesa Port of Entry wait to use biometric kiosks in San Diego. A new study says visa overstays exceeded illegal border crossings. As the Trump administration demands funding for a border wall to stop illegal immigration, a new study finds that for the seventh consecutive year, visa overstays far exceeded unauthorized border crossings. The report released Wednesday by the Center for Migration Studies of New York finds that from 2016-2017, people who overstayed their visas accounted for 62 percent of the newly undocumented, while 38 percent had crossed a border illegally. "It is clear from our research that persons who overstay their visas add to the US undocumented population at a higher rate than border crossers. This is not a blip, but a trend which has become the norm," said Donald Kerwin, CMS' executive director, in a statement. "As these numbers indicate, construction of hundreds of more miles of border wall would not address the challenge of irregular migration into our country, far from it." The study also finds that the undocumented population from Mexico fell by almost 400,000 people in 2017 and that since 2010, the number of undocumented from that country fell by 1.3 million. "We have made tremendous progress since the year 2000 in reducing undocumented immigration into this country," the study's author, CMS senior fellow Robert Warren, told NPR. Warren was the director of statistics at the Immigration and Naturalization Service from 1986 to 1995. He said that both the Bush and Obama administrations had roughly doubled the size of the Border Patrol and that the country has seen results. "In another era, we would be celebrating our success," said Warren. The study also finds that in 2017, for the first time, the unauthorized population from Mexico constituted less than one-half of all the undocumented people in the U.S.
At the same time, Mexico was the leading country for visa overstays in 2016, "about twice the number from India, China and Venezuela," according to the study. The number of undocumented people coming from Venezuela, which is wracked by political and economic turmoil, increased from 60,000 in 2013 to 145,000 in 2017. Virtually all are visa overstays. "Since more than one half of all US undocumented residents arrive by air, visa-issuing posts have become the real frontline deterrent to undocumented migration," the study concludes. "This report suggests that more attention and resources should be given to that crucial mission of the US Department of State."